Take your family on a journey of discovery through London’s historic heart at the Museum of London. HiddenCity have teamed up with the Museum to give you a new way to find out about the capital. Solve clues by text message to step through time. Expect to see, touch, hear and even smell exhibits spanning prehistoric, Roman and medieval London, right up to the 20th century and present day city. This will be an easy trail and take about two hours to complete including a break halfway through in the Museum café. Entry to the Museum itself is free. 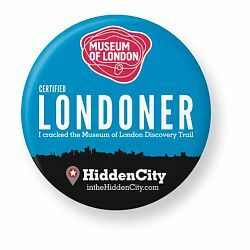 Solve all the clues to be eligible for a certified londoner badge, available for each member of your team (up to four people). After completing the trail show your congratulatory text to the Museum hosts at the information desk to claim your badge. The trail is suitable for all ages. Children must be accompanied by an adult and those aged 8 years or under may need assistance with the clues. Ideal for two to four people. £16 per team.